Belize it or not! Definitely Belize it. On the island of Caye Caulker it’s party time all the time. This has got to be the reason why I have been there twice. Most travellers arrive in Belize by bus from Mexico, Guatemala or Honduras. Belize City is a little rough around the edges and most backpackers give it a miss and head straight to the office at the wharf to buy a ticket and head off to Caye Caulker. 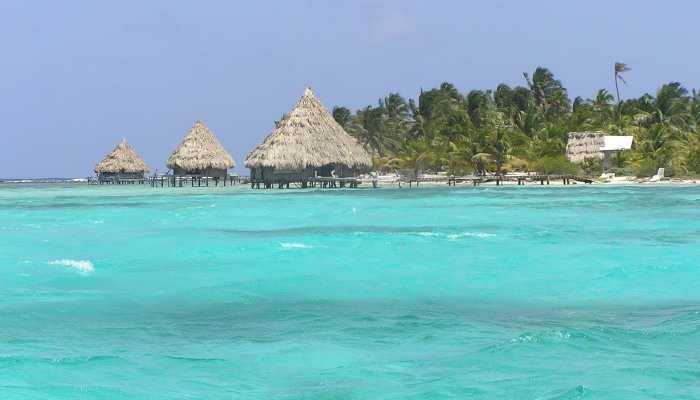 The major town in the south of Belize is Punta Gorda. Out from here is Moho Caye, The Snake Cayes, Hunting Cayes, and the Sapodilla Cayes. Placencia is a little further north of Punta Gorda and out to sea from here is Rendezvous Caye and Gladden Caye. Of course there are more cayes than those two and more off the coast from every main town. I’m just naming the main ones. Out from Dangriga are Tobacco Caye, South Water Caye and Carrie Bow Caye. From Belize City there is Long Caye, Half Moon Caye, Blackbird Caye, English Caye, Spanish Caye, Hicks Caye, Caye Caulker and Ambergris Caye. Along Lighthouse Reef is the famous Blue Hole. Stretching from the Gulf of Honduras and right along the coast and up Mexico to Cancun is the barrier reef. This is the 2nd longest reef in the world. The waters off Belize are a turquoise colour and so beautifully clean and clear. The snorkelling and diving is second to none. It’s like you are not even looking through goggles and water. The colours of the fish and coral are out of this world. I especially like the iridescent blue fish. There are nurse sharks that lie in your arms like babies. Its diver’s heaven. Not forgetting the mainland. Belize has its own Mayan Ruins in the rainforest to enjoy. Northern, Central and Western Belize have many majestic Mayan cities. You can try the zip-lines through the jungle canopy, explore caves or go canoeing down a peaceful jungle river. Street stalls, museums, galleries, night life, culture, music and lots of public holidays and celebrations means there is something for everyone. The Belizean people are friendly and when they don’t want you to know what is being said revert to talking in Creole. I hate that but as I have a friend in Belize I am going to spend a lot more time on my next visit through and learn Creole. ( Note; some people spell it ‘Kriol’). English is the language of Belize but Spanish is often spoken in the northern province of Corozal. It’s not all that easy to say something negative about Belize as it is a super friendly place so all the usual precautions apply. Don’t have anything on you you don’t want to lose at night if you go drinking. Not so much on the islands as in Belize City. Even if you don’t have a diving license the snorkelling is amazing and will keep the kids happy for hours. Take a day trip on a sail boat out to the reef. I can’t wait to be back there. On Caye Caulker and Ambergris Caye there is no need to book accommodation as it is so easy to find somewhere to stay. There’s an abundance of hostels and some nice hotels. Try sea kayaking. It’s a great place to learn. Go along the waterfront in the evening. This is where you will find the tour operators and it’s a great time to get some freshly cooked seafood and socialise with the locals. My recommendation for a day reef trip, ‘Black Hawk’. Big Steve is a great guy with a fun sense of humour and he feeds you well. Hop on a boat at night and go to the bar on the other part of Caye Caulker. You can lie in a hammock on the beach and listen to the music. Just mention it to a local and they will help you out. The cost is about $5 return. You can come back at whatever time you like. From Ambergris Caye you can catch an early morning boat to Corozal and then a taxi over the border to Chetumal in the south of Mexico. If you have your International Drivers License on you then hire a golf buggy on Ambergris Caye. It’s much bigger than Caye Caulker and the best way to see the whole island. If staying on Caye Caulker and you want to do a day trip to some Mayan ruins you can do them from here. The main street has plenty of tour agents advertising these day trips. When you arrive in Belize you will have to put the address of where you are staying. If you have not booked anywhere, have a quick look on the internet before departing to Belize, and write an address down.